Stamped and colored about six of MFT's Adorable Elephants on Canson Smooth Bristol paper to practice using my new Arteza Real Brush Markers . I am starting to get the feel of them, but the paint seems to sit on top of the paper and take a while to dry. Some of the shading "puddled" on the edges despite using a barely damp water brush. He still looks pretty cute and has a nice sparkle from the Wink of Stella brushed over the top of the image. I used the sentiment for the principle of repetition, and since I didn't get the "chromosome that aligns things straight", so I tilted the panel for camouflage purposes. Don't believe that I have repeated a sentiment before, but it's a nice technique. Such a cute little elephant! Love the cute birthday card you made with him! 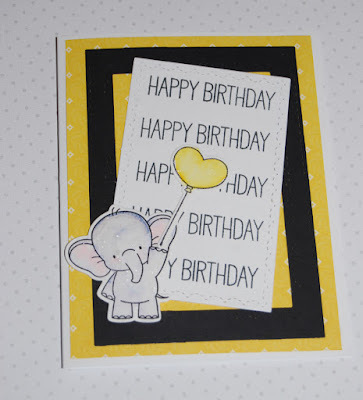 What a great way to spend a rainy day - card making in your craft room! Thanks for linking up to Cropstop!